St. Martin's Griffin, 9781250046390, 400pp. The gripping tale about two boys, once as close as brothers, who find themselves on opposite sides of the Holocaust. Elliot Rosenzweig, a respected civic leader and wealthy philanthropist, is attending a fundraiser when he is suddenly accosted and accused of being a former Nazi SS officer named Otto Piatek, the Butcher of Zamosc. Although the charges are denounced as preposterous, his accuser is convinced he is right and engages attorney Catherine Lockhart to bring Rosenzweig to justice. Solomon persuades attorney Catherine Lockhart to take his case, revealing that the true Piatek was abandoned as a child and raised by Solomon's own family only to betray them during the Nazi occupation. But has Solomon accused the right man? 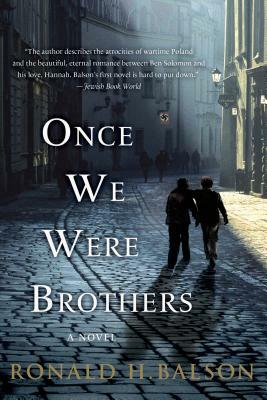 Once We Were Brothers is Ronald H. Balson's compelling tale of two boys and a family who struggle to survive in war-torn Poland, and a young love that struggles to endure the unspeakable cruelty of the Holocaust. Two lives, two worlds, and sixty years converge in an explosive race to redemption that makes for a moving and powerful tale of love, survival, and ultimately the triumph of the human spirit. RONALD H. BALSON is a Chicago trial attorney, an educator and writer. His practice has taken him to several international venues, including villages in Poland that inspired his first novel, Once We Were Brothers.